Body Positive facilitates a range of educational events throughout the year, both for people living with HIV and also anyone else that would like to engage and up-skill in the sector. 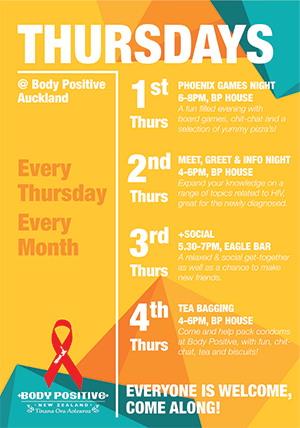 In addition to our regular services, we also often run social events throughout the year for people living with HIV in New Zealand, to provide a safe space to meet others and share experiences. Dates for the 2019 HIV+ Men’s Retreat have been announced. Starting on Friday 26th to Sunday 28th April, the Retreat will once again be held at Vaughan Park in Long Bay just north of Auckland. During the retreat there will be a range of workshops & discussion groups planned, as well as therapy treatments and entertainment, all of which is optional, allowing you to participate in as much or as little as you prefer. There will also be plenty of time to be on your own, or with others, to relax, go swimming, walking or any other activity you may want to pursue. This fee covers all accommodation (if applicable), meals, the retreat programme, and assists with transport to the event. As with previous years, the Wellness Fund it will not be able to support registration fees for this event. 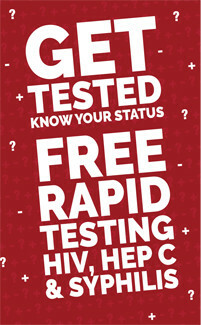 Anyone finding the registration fee difficult to raise should contact Body Positive and discuss the options. We are happy to accept payments in instalments if this is easier for you. If you require transport from Auckland City to the Retreat, a free shuttle service will be available from Body Positive House to Vaughan Park on Friday afternoon, returning on Sunday afternoon. Please be aware that the this years Men's Retreat will once again be ALCOHOL FREE. Any participant found consuming alcohol during the retreat weekend will be asked to leave. If you are located outside Auckland and you would like help to cover the cost of your transportation to attend the 2019 HIV+ Men's Retreat, you must make an application to the Wellness Fund for assistance. The International AIDS Candlelight Memorial is one of the world’s oldest and largest grassroots mobilisation campaigns for HIV awareness in the world. Started in 1983, the International AIDS Candlelight Memorial takes place every third Sunday in May and is led by a coalition of some 1,200 community organisations in 115 countries.